Retroguru – Page 2 – Sqrxz by Retroguru – Mindblasting frustration deluxe! Yannick ‘Yannickescu’ Erb updated Sqrxz 2 for AROS! Enjoy the change of screen effects on the fly and the freshly added “Soundcheck” in the options menu, if you like the tunes, but never made it far. Sqrxz 4 v1.01 for Windows! Minor update for Sqrxz 4, starting with the Windows build. Thanks to Lars Persson (AnotherGuest) making this update possible! Frank Wille updated his Sqrxz 2 ports for Amiga OS4, MorphOS and NetBSD i386. The NetBSD PPC port is an initial port! We hope you will be enjoying this little update, as it will be most likely the last one for Sqrxz 2. Thanks Frank! Xavier ‘Indiket’ Vallejo of dreamcast.es fame sent in updates for Sqrxz 2 for Dreamcast and Mac OS X. Thanks Indiket! Fabio ‘oibaf’ Olimpieri updated Sqrxz 2 for Wii and GameCube! Enjoy the change of screen effects on the fly and the freshly added “Soundcheck” in the options menu, if you like the tunes, but never made it far. Sqrxz 2 v1.10 for Windows! One major complaint we had about Sqrxz 2 was: “We like the tunes made by Alexander Wiklund, but we are not able to go further to the next level!”. An important feature has been now added to Sqrxz 2… our all beloved Soundcheck-Option! Listen to all tunes, without playing throughout all levels! 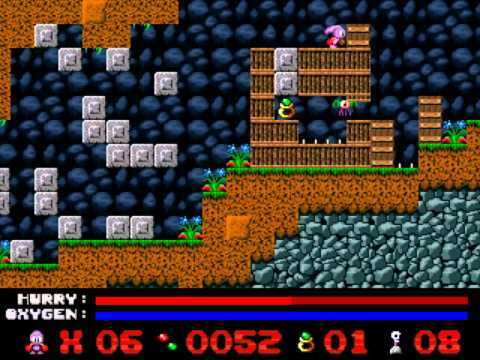 Sqrxz 3 v1.0 for Amiga OCS – Trainer by Flashtro! The guys at Flashtro apparently trained Sqrxz 3 already, so if you think the game is too hard, what about using a trainer? As Sqrxz 3 very much relies on elements of speed, precision and puzzles it’s still recommended to play as long as possible without the possibility of a trainer. 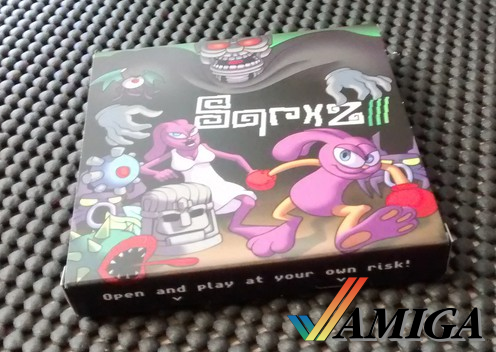 Sqrxz 3 v1.0 for Amiga OCS released! With the hard work of Frank Wille, our expert if it comes to Amiga Assembler, we were able to get out another fresh Amiga game in 2015. The responsible wonderful people for the graphics were Simon Butler (Sprites and Tiles), Anne Claire Riffaud Declercq (Storyline and Title-Logo) and Virgile Metier (color reducing to match the Amiga OCS requirements). Not to forget the superb chiptunes by Alexander Wiklund who cheer you up during the whole game. Denny Müller played also a big role in doing the trailer (okay that one is already a bit older, as we had the game out for Windows PC’s in 2011 already) and designing the wrapper, booklet and floppy label for the physical release. Last but not least Shahzad Sahaib is responsible for the project and kept everyone tight together to make everything reality! We would be pleased if you give us a hand and spread the word about this fancy new Amiga OCS game :) Certainly it works on basically all OCS/ECS/AGA Amigas with 1MB RAM (or more).